Friday was a full day in Paris. We started out at 10AM. 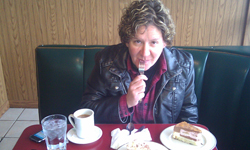 Linzy was pounded by the jet lag and opted out of the day. Her cold had flared up, and we all decided she should just stay in bed and rest. Nikole and I visited places Linzy was not as interested in going to. 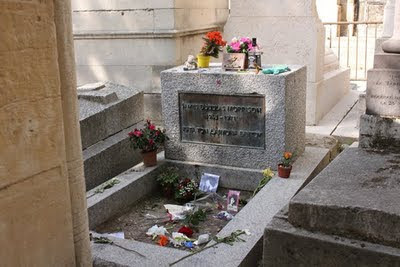 We started the day out by going to the Père Lachaise Cemetery which is where Jim Morrison is buried. The site was surrounded by old groupies and young fans alike; many stood around talking about smoking a joint in his honor. The site is now fenced off because of the constant vandalism. While we were there, one 20ish-year-old fan climbed over the fence and kissed his tombstone. Apparently he lights her fire. From the cemetery that Napoleon built, we headed over to the Moulin Rouge. The Moulin Rouge is the birth place of the Can-Can dance and cabaret style entertainment. 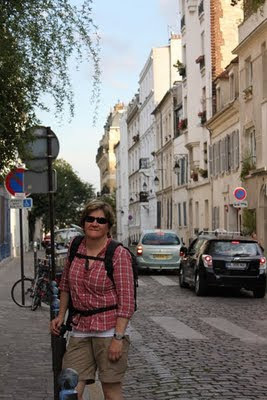 After exploring the area, we headed in to Montmartre. Many artists had studios or worked around the community of Montmartre, such as: Salvador Dalí, Amedeo Modigliani, Claude Monet, Pablo Picasso and Vincent van Gogh. Today, many artists still hang out there and you can walk the streets and watch people paint. 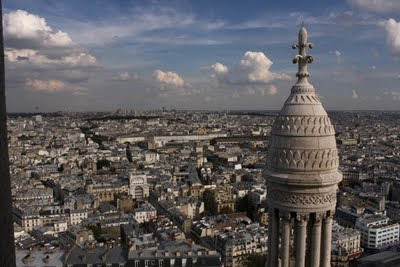 We sat in a café sipping espresso in the shadows of Sacré-Cœur Basilica (Basilica of the Sacred Heart of Paris). We toured the Salvador Dali Museum which had 300 pieces and then wandered to the Basilica – rumored to have the best view of Paris. The view was spectacular and the 300+ steps climbing to the top justified the crepes soaked in Marnier afterwards. The narrow spiral staircases are becoming familiar in all these old buildings. The staircase was so narrow it touched both shoulders in some places. The view was amazing! It was 360 degrees of history below us, and pretty breathtaking. We could see the Eiffel Tower across the city. We decided to head that way; Nikole and I drank champagne under the tower and toasted our trip on the banks of the Seine River. Our day turned to night and we hopped on a night cruise of the Seine. 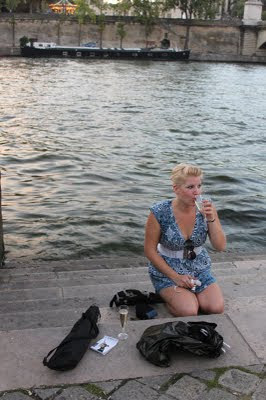 It was wonderful sipping wine and boating up the river enjoying Paris by night. 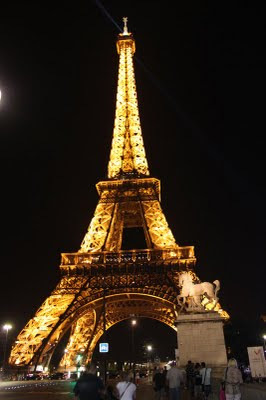 The Eiffel Tower was lit with orange lights, as were most of the city lights. They added an extra sparkly dash of lights that seem to turn-on every hour. It seems that the French like to sit along the river at night with their baguettes and wine and chat and enjoy the river. The French like to do that everywhere. We finally rolled back into the hotel at 11PM. What a packed day! "It seems that the French like to sit along the river at night with their baguettes and wine and chat and enjoy the river. The French like to do that everywhere." Sounds like a great day with your daughter. Hope Linzy gets over her jet lag! The panoramic photo from the Basilica was awesome.